Altoids push the boundaries of taste in this series of three TV advertisements, Fruit Pants, Slap, Half & Half, in which blindfolded participants take the Altoids Sours Challenge. 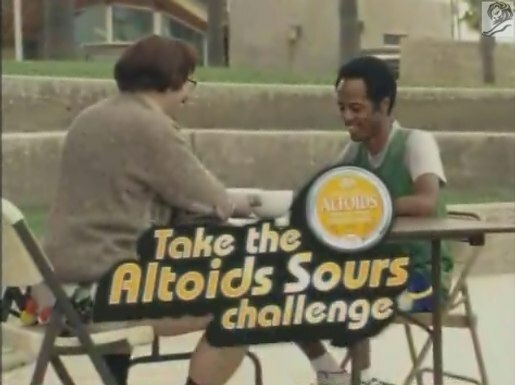 A deviant researcher invites basketball player to sample Altoids Sours blindfolded while he lewdly swings his fruity pants. “Taste the fruit”, yells the guy to his friends, oblivious to the perversion he’s just missed. A sadomasochist female researcher dons black gloves to slap her blindfolded challenge participant on the face. “How did you like that?” “I liked that one a lot!”. A male participant enjoys his raspberry-flavoured Altoids Sour so much that he asks for another turn. But he’s only allowed one go. He swivels around to reveal his female side and talks his way into a second sample – this time turning up a mango flavour. The Altoids Sour Challenge campaign was developed at Leo Burnett, Chicago, by chief creative officer John Condon, creative director/art director Noel Haan, creative director/copywriter G. Andrew Meyer, art director Matt Miller, copywriter Megan Sovern, executive agency producer David Moore and agency producer Eric Faber. Filming ws shot by director Tom Kuntz via MJZ with director of photography Chris Soos, executive producers David Zander and Jeff Scruton, producer Scott Kaplan. Editor was Matt Wood at Whitehouse Post. Visual effects were produced at Optimus. Music was produced at Earhole. The Altoids Sours Fruit Pants, Slap and Half & Half won Silver at the ANDYs, Gold, Silver and Bronze at the Kinsale Shark Awards, Best of Show at the Hugo’s, two merit recognitions at the Art Director’s Club of New York and three merit recognitions the One Show.